Home » About CETOP » What is fluid power-hydraulics and pneumatics? What is fluid power-hydraulics and pneumatics? Fluid power provides the components and systems which form the foundation of drive and automation technology. Fluid power is used to drive and control all kinds of mechanical motions; indeed, there is scarcely a machine or vehicle in the world today which could operate without fluid power - hydraulics and pneumatics - to deliver the necessary force and torque wherever linear, rotary or combination movements are required. A major advantage of fluid power is the compact design of its components, giving the high power-to-weight ratio which distinguishes it from all other forms of propulsion. 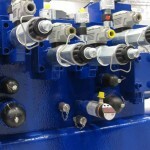 Hydraulics and pneumatics manufacturers are major suppliers to the entire mechanical-engineering industry and many other industries, such as construction and agricultural machinery, conveyor systems, food and packaging machinery, woodworking and machine tools, electrical engineering, shipbuilding, the metal industry, mining, aviation and space travel, medical technology, environmental technology and chemical industry.